Pinatas are popular as a game-like activity at special events and birthday parties. To make your own pinata at home, there are a couple of do-it-yourself techniques you can consider using like the paper mache or paper bag methods. You will be inspired when you discover how easy it can be. If you make your own pinata, you can get creative and make it any size or shape that you like. A pinata is a container filled with candies and small toys. It is usually decorated to be bright and colorful, and it is made in a variety of shapes and sizes. You can hang it from a tree branch or other high place. 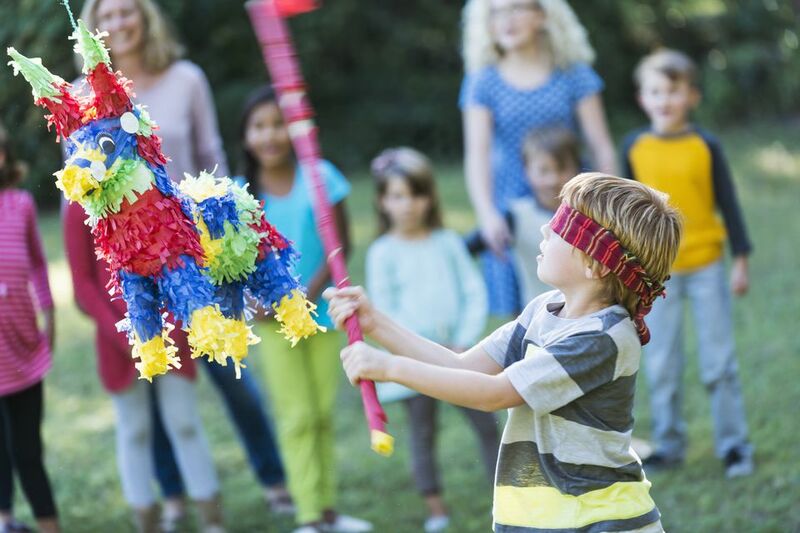 Traditionally, one at a time, participants are blindfolded, spun around a few times, and then they blindly swing a stick or bat at the pinata trying to break it open so the candy and toys inside spill out. When the pinata is broken open, everyone scrambles to the ground to gather as many goodies as possible. There are two methods you can use to make your own pinatas at home. The first is by using paper mache techniques. While this method is messy and the process takes a few days to complete, the result will be a more traditional, sturdy, and likely, a better-looking pinata. For this method, you will need a balloon, newspaper, and paste to make the base of the pinata. Then, you will need items to decorate the outside of it. The other method is to create a simple pinata using a paper bag. This method is quicker and less messy. If you are pressed for time, then this would be the way to go. One downfall with this method is that a paper bag pinata might not break as nicely as a paper mache one. You can make a small one with a lunch-sized brown paper bag or you can use a supermarket brown paper bag. Other items you need include tissue paper to stuff inside the bag to help keep the bag's shape and decorations for the outside. For both of these methods make sure you do not forget the goodies for filling the inside of the pinata. While you can embellish a paper bag pinata any way you like, you will need to get more creative if you use the paper mache technique. In the paper mache method, you use an inflated balloon to help create the base; it would be round in appearance to start. With a balloon or other thin items as the base of your paper mache, you then add on details by using cardboard, masking tape, and other objects around the house like food cartons, egg cartons, or toilet paper rolls to give your pinata its final shape. For example, if you want to make a pinata that looks like a fish, start with a large balloon for the round body part of the fish and then cut a tail and fin shapes out of lightweight cardboard. You can wrap the cardboard with newspaper to give it a little more body and shape. Then, attach the fins and tail to the fish using masking tape. Cover up the frame of the fish with fringed tissue paper to give your fish design some colorful flair.